Dodiyós is a distinctive destination for fresh, seasonal flavors from every country that touches the Mediterranean Sea. You'll find authentic Greek dishes as well as foods from Spain, Italy, France, Turkey, the Balkans, North Africa and the Middle East. Exotic colors, rich woods, handmade textiles, and intriguing antiques and collectables grace a unique restaurant with all manner of seating, a lively tapas bar and even a small souk. 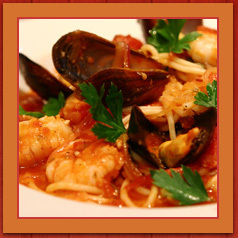 Dodiyos is Birmingham's choice for a traditional Greek restaurant that offers all the flavors of the Mediterranean. The restaurant features a 45-seat tapas/meze/cicchetti bar with rich red concrete and colorful textiles from Turkey. Spanish, Middle Eastern and Italian versions of small-plate foods are cooked while you watch. It's casual, comfortable and perfect for conversation. In niches along the walls and on shelves here and there, you'll see a lifetime of collecting from countries throughout the Mediterranean basin. Centuries-old cabinets, a keystone that dates to Roman times, form-meets-function bowls and urns; a terra cotta chimney pot, and a marble plaque from an ancient fountain mix with contemporary pieces amid swatches of hand-woven, Anatolian rugs. Foods are seasonal, fresh, varied and decidedly different with traditional and innovative dishes of lamb, beef, pork and poultry; lots of seafood; locally sourced produce; and even goat and wild game. Many of the dishes are unique to this restaurant, and all are imaginatively served on handmade ceramics and unique copper pieces. 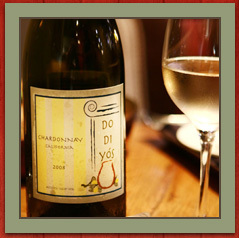 Special drinks and some wines are available nowhere else in our area. There are "layers" of comfortable seating at dodiyós, accommodating every guest's mood for dining. The interactive tapas bar - a different kind of chef's table - is at the heart of this restaurant. 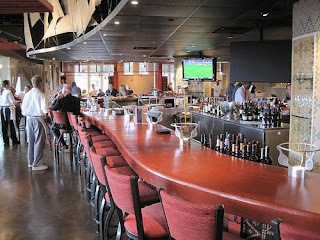 People who prefer quieter dining (but still want to be part of the experience) will enjoy the tables surrounding the bar. 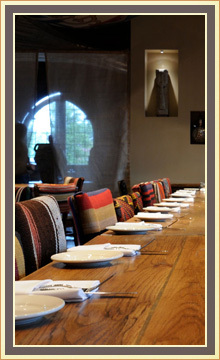 You'll find plenty of cozy banquettes and even family-style seating at large, hand-hewn, wooden tables. Perimeter, interior cabanas will allow more seclusion for intimate groups. There are two totally separate private rooms for large-group dining and parties. 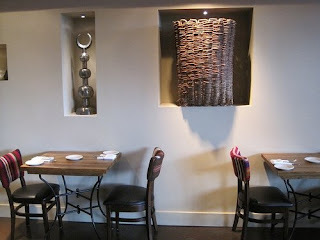 And for those who love dining outdoors, there is plenty of patio seating, reminiscent of Plaka in Greece. Restaurant owner, George Sarris: " I chose the name dodiyós for this restaurant because I want it to be a true family place (the name means mother, father, grandfather). But also, I saw this as an opportunity to honor the people who made me who I am today and my children who enrich my life every day. Dodiyós is much more than simply a name. It represents generations of taste." My mother was my dining companion today. We dined for lunch , though they are serve an extensive dinner. When seated diners are given a small bowl of a feta/mayo spread that is drizzled in olive oil and comes with bread slices. I am not a mayo fan, so I did not care for the spread. My mother, however found it to be very good. Mother and I found the lunch menu a bit pricey and chose to split two dishes. We chose to split two "salads". The Greek Village Salad “Yorgos Salata” which is a cucumber-and tomato salad with onions, feta, extra-virgin olive oil and dried mountain oregano ($9.50). This salad was very pretty. The tomatoes, very fresh and deep red. The cucumbers, I would have preferred to be cut smaller. They were mostly the thick hard to chew outer skin. I would have preferred it to be cut completely off or at least in thinner stripes. I also think because the cucumber was so large that it had big seeds, which were cut leaving little of the fleshly. light green inner cucumber. The feta was a substantial cut and delicious. The other salad we chose to share was the Konstadinos’ Greek Potato Salad. More like a side dish than a salad, it was big enough for two people easily. It really could be a meal. The baked potatoes were cut into chunks and baked sprinkled with salt and pepper, drizzled with olive oil and topped with green, red or white onions $5.95. Delicious! And my favorite thing we ate, mother agreed. There is a dessert menu, but mother and I split something that was recommended by our waiter and not on the menu, Hazelnut Bread Pudding. It was served with chocolate syrup and fresh fruit and a dollop of cream. It was very rich and tasty. Recently I posted about the fun of Tappas, and at Dodiyo's they have a traditional tappas menu. 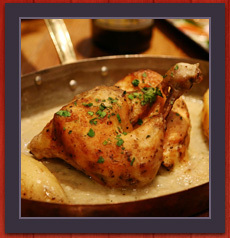 Dinner service begins at 3:00pm each day. I just found this blog! I am a blogger from Alabama! I will link you on my blog! 20 Newly Listed Alabama Bloggers in October! Lisa Leonard Event, and Why Meet in Person? Blogger Meet-Up at iCantina - and save money!! Don't Forget - Lisa Leonard Meet-Up This Friday! !